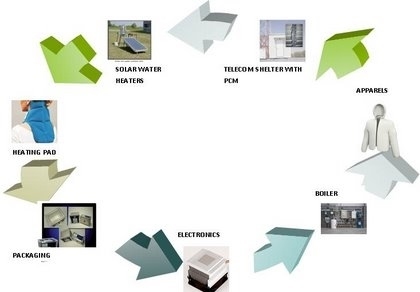 Inorganic Phase Change Materials (PCMs) are generally Hydrated Salt based materials. Micro-encapsulation is a process in which tiny particles or droplets are surrounded by polymeric material to form capsules. In a relatively simplistic form, a microcapsule is a small sphere with a uniform wall around it. The m aterial inside the microcapsule is referred to as the core, whereas the wall is called a shell. Most microcapsules have diameters between a few micrometers and a few millimeters. 1. Problem of excess foam formation has been encountered by reducing the Emulsifier content in the emulsion. 3. Capsules of same quality have been reproduced successfully. The microcapsules containing n -octadecane as the core material and melamine-formaldehyde resin as the wall material have been synthesized by in situ polymerization method. 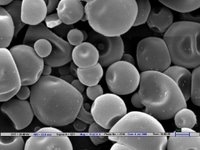 A systematic study has been carried out to investigate the effect of the method used in the preparation of reaction emulsion mixture, and the curing conditions used during the encapsulation process on the properties of microcapsules. The microcapsules so obtained are characterized for their core content, encapsulation efficiency, mean particle size distribution, and thermal & solvent stability. Using the modified encapsulation process with a formaldehyde-to-melamine molar ratio of 8 and core-to-wall ratio of 2, microcapsules with a high core content of 70% and a heat storage capacity of >160 J/g could be obtained. The capsules are found to be stable at temperatures more than 80 °C and to cyclohexane wash.